The title might seem an oxymoron but all will become clear in a moment. This photo is of a pony that was shod about three weeks earlier. Sadly his owners are of the opinion that they are getting good service from their farrier – he visits once every eight weeks to tend all ten ponies/horses and he charges an average of £45 (€49/$55) a time per pony. Seems reasonable, you may think, was it not for the work that he carries out and its quality. The ponies are unshod in the winter and half-shod in the summer (because they are ridden outside a couple of times a week!) so what we see here is the first shoeing of the summer season. Enough conclusions can be drawn about the state of this hoof after a winter indoors and the obvious question is why does the farrier deem it necessary to use a rear shoe on a front hoof? 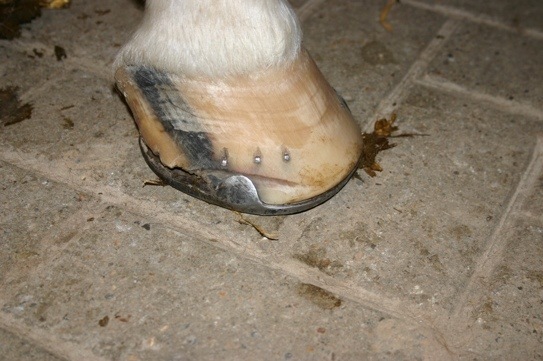 As just about any good farrier will tell you, rear shoes just are not intended for front hooves – the shape of the shoe and the position of the holes for the nails is all wrong. If the farrier considers a shoe unsuitable, then he should (re)manufacture one such that it will fit and not resort to bad practice. But the real shock comes when we look at the rear hooves of almost all the ponies; their condition is bordering upon neglect. They are splintered, chipped, high-heeled, with partially hollowed or separated walls; there is no sign of any form of roll around the edges and the bars are almost universally untouched. The latter is in one case so bad that the bars have grown almost as far forward as the point of the frog and have folded over and collapsed upon themselves.